Twice this week on two different days, I was asked to define a sweater knit fabric. Though I can go on and on about the topic and I may knit or design them most days in a week, I still haven't found a precise or "official" definition. To read how I defined the sweater knit fabric previously, please read my post on The Sweater Knit Fabric. Pictured above are two sweater knit fabrics for a soon-to-be shell. The design for the top is completed, though I have yet to take scissors to fabric. 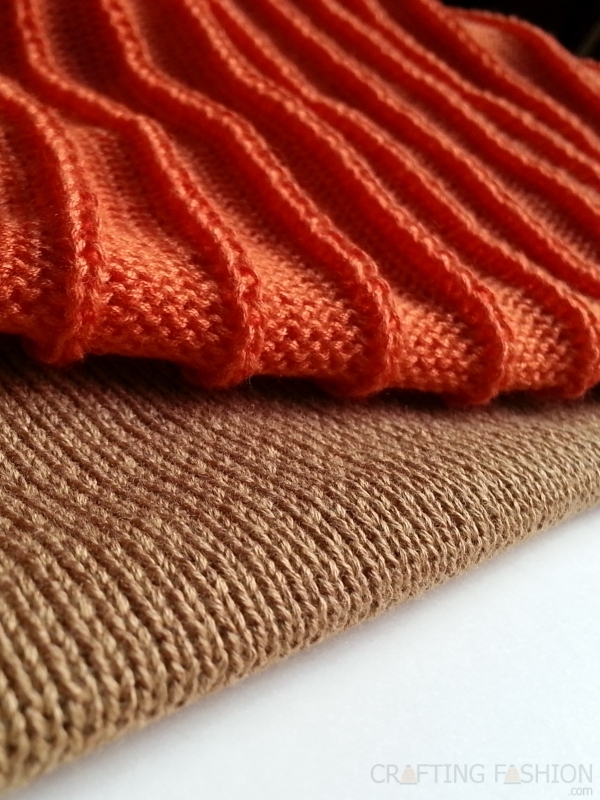 The tangerine fabric is called an embossed rib knit (which I hope to offer in the shop soon). Technically, it's a true rib knit, but it doesn't cling to the body the way most rib knits will. The golden tan fabric is plain jersey. Both are knitted of soft, luxurious and drapey bamboo. On this blog I've covered both bands and bindings for finishing sweaters. For this one I'll be using a facing to create an asymmetrical neckline. The trick, I think, is to use a facing that doesn't mess with the drape of the main fabric. We'll see what happens.